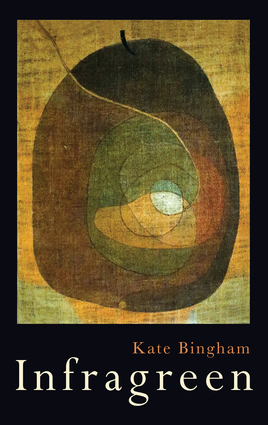 Perceptive, persuasive and intricately made, the poems of Kate Bingham's third collection, Infragreen, take the reader on a startling and unfamiliar journey through everyday experiences and phenomena. Her keen eye, reflectiveness and quiet wit endow her subjects with a shimmering freshness. Set within the four walls of home, on the streets of north London and in the Yorkshire countryside, the poems build out from mundane activities such as taking the pill, traveling a daily bus route and scything thistles. In Bingham's hands, the familiar sights and hypnotic routines that normally lull the brain into unthinking acquiescence are the starting points for finding new richness in the world around us and our participation in it. The book contains three sections, each infused by a different season and place, but a spirit of serious play presides throughout. Contemporary versions of Hardy and Frost, a collage cut from old favourite Christmas carols, and a refleshing of some of English poetry's oldest clichés are part of it, but so too is Bingham's fascination with pattern: the patterning required by some of poetry's stricter traditional forms, and pattern as content, a subject in itself. Those who know Bingham's earlier work will recognize in this collection her playful, often darkly comic, appreciation of the surreal, which features hearts and hands, feet, and even a pair of shoes with minds and agenda of their own. Elsewhere, a milk-bottle breathes, a pocket of air turns into a winged creature, flies serenade the poet whose mortal scent has drawn them into her room. A ballad at the start of the final section tells the story of an artisan paper-maker whose origami creation is so perfect it comes to life, only to be destroyed again by its maker. But beneath the gently cynical, almost self-deprecating tone lie Infragreen's darker themes: a base note of environmental and existential anxiety in which teasing self-deprecation can mutate into a desire for disembodiment, and a ruthless wishing away of consciousness and self. Kate Bingham is a poet, novelist, and filmmaker who lives in London. Her previous collections are Cohabitation and Quicksand Beach, which was nominated for the Forward Prize Best Collection in 2006. 'On Highgate Hill' was nominated for the Forward Prize Best Single Poem in 2010.